Rotating Star Sky Projection Night Light Just $21.99! Down From $56! You are here: Home / Great Deals / Amazon Deals / Rotating Star Sky Projection Night Light Just $21.99! Down From $56! Head over to Amazon where you can score this Rotating Star Sky Projection Night Light for just $21.99 down from $55.99 PLUS FREE shipping with Amazon Prime or for orders over $25! This remarkable lighting produces a mystical light effect that looks like the night sky and provides a relaxing, soothing atmosphere. This projector is lightweight and compact. It is beautiful with a simple design and easy to operate. The project is perfect for family events or small gatherings. It can also be utilized as a nightlight for a child’s bedroom. Ideal for relaxing and meditating, and would even be a great tool to help put the kids to bed. [ TIMER SHUT OFF ] Added features of timer make star night light more practical. Watching the stars and the moon to sleep, it will be closed according to the time you set. You can falling asleep at ease. [ EASY OPERATION ] There are 4 pcs LED Beads of warm light, blue light, green light, red light, changing color by 2 Push-Button (C,D). Rotating by B-button,Timer shut off by A-button(Each press increases five minutes). [ 360 DEGREE ROTATING ] Night Light Kids Rotating its base, there will be different colorful space. With the NEW Motor, there is a faint sound of the motor when it spins. The Higher power Beads are more Bright and more beautiful，Lighting Range is also bigger than the old one. [ MORE BRIGHT ] Night Light Kids with 4 buttons located on the front which labeled A, B, C, and D. A – Definite Time, B – Rotary Control Button, C – Color Conversion, D – Night Light. Power by 4 x AAA battery (Not Included) or USB cable(Included). 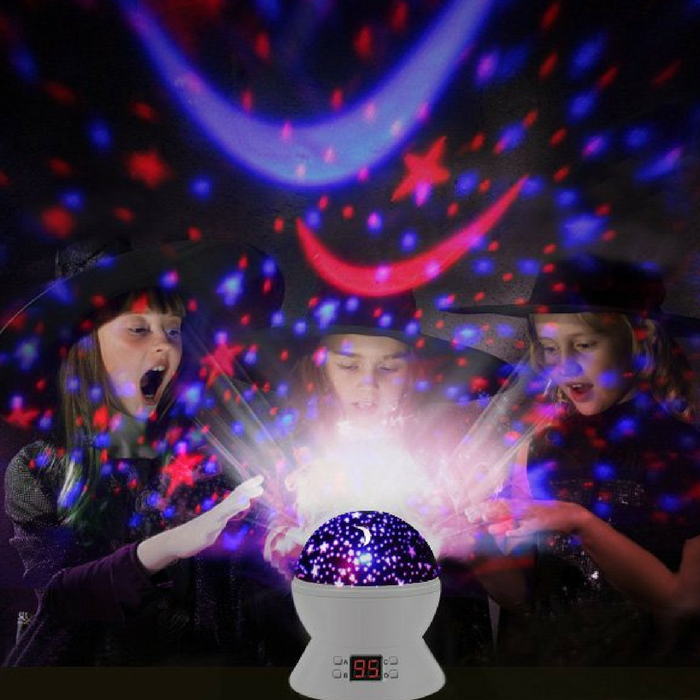 [ BABY WILL LOVE IT ] EASY AND FUN, Your child will be mesmerized by the rotation of the galaxy while feeling comfort in the projecting lights. Luminous and colorful LED lights will create a calm ambiance in your child’s room, giving your child a good night’s rest with this night light for kids room.